Our family is experiencing new forms of transportation we never imagined. A year ago, we were a boring suburban bi-ped, mini-van/car/truck driving family. That has changed within a week. It is a contrast of worlds, with my son away at West Point and us here at home. Life often holds a lot of irony. On Monday my oldest OS will be traveling by a Blackhawk helicopter to a new training site for Cadet Basic Training. A Blackhawk Helicopter travels up to 221 mph. This is part of the final leg of Beast. I know my boy is going to be excited about having this experience even if it makes his mama nervous, very nervous. On the other hand, I’m getting around differently. 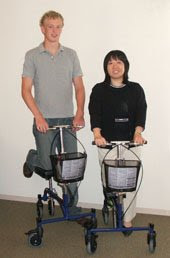 A non-electric wheelchair can travel about 3.7 mph. How do I know? I googled it. Since Saturday, thanks to a friend, I am traveling regularly by wheelchair when I am downstairs or out of my house. This might not mean much to you but until Saturday I’d been stuck at home. I hadn’t been outside since going to the doctor to learn I had a broken foot. On Saturday I traveled to Borders in a wheelchair! FREEDOM! I was probably as excited to be among the public as Nate will be getting a panoramic view of West Point and its environs. Then on Tuesday I will hopefully receive my Rolleraid, which is the BEST Orthopedic Leg Support Scooter around. It will have a basket and a water bottle holder! Wahoo! Who knew that a week ago something like this would seriously make me happy? I intend on being as happy as these two folks pictured in their advertising. Wee! I hope to be whizzing around topping 5 mph in no time at all. Nathan is sleeping with a rifle by his side. It’s not good if he can’t find his rifle so he always keeps it close on the field. I’m sleeping with my crutches just an arm’s length away. It’s not good if I don’t have my crutches. That’s when I resort to hopping, crawling or scooting. My oldest OS has thrown a grenade. My middle OS threw a football and will see the hand specialist on Monday. He might have torn two ligaments on his thumb. ← Pity Party Gains a New Member! I am soo soo sorry to hear about your foot. Not fun. I am having a pity party here for myself, but I will indeed send prayers your way. Maybe we can exchange? Sometimes it is easier to pray for others than ourselves. At least I think so. So prayers are coming your way! Life is definitely full of surprises! Sweet ride! Can you pop a wheelie with that thing?? Um yes, I will need photographic documentation of the rolleraid. Will you be ridig that thing to school? Will it hold your box of junk? Have you come up with ideas for incorporating the broken foot and transport device into a presentation?In spite of my making fun of the roller, I am praying for you and the OS.